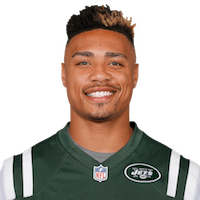 Published: Jan. 1, 2017 at 03:08 p.m.
New York Jets wide receiver Jalin Marshall stretches out for 6-yard touchdown. Published: Nov. 6, 2016 at 04:14 p.m.
New York Jets quarterback Ryan Fitzpatrick hits wide receiver Jalin Marshall for a 18-yard touchdown. Published: Sept. 15, 2016 at 11:05 p.m.
New York Jets QB Ryan Fitzpatrick finds wide receiver Jalin Marshall for 27 yards. Published: Aug. 11, 2016 at 08:59 p.m.
Watch as New York Jets wide receiver Jalin Marshall makes defenders miss during an 84-yard kickoff return.